In 1989, Robert Lazar came forward with an incredible story : He had been recruited by the US government to work at the top secret Groom Lake/Area 51 research base better known as "Dreamland" (actually at the S4 site, Papoose Lake which is a few miles to the south of Groom Lake) to reverse engineer alien spacecraft! Lazar claims that when he first saw disc-shaped craft at the base, he concluded they were secret — but decidedly terrestrial — aircraft, and that sightings of test flights were responsible for UFO reports. Only on closer examination of the craft did Lazar conclude it was designed by and for extraterrestrials. 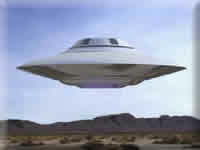 Lazar claimed that the placeholder element ununpentium (Uup) was the fuel that enabled extraterrestrial craft (commonly called flying saucers or UFOs) to travel interstellar distances. Uup's role was twofold. Firstly, it provided an energy source which would step up to ununhexium under particulate bombardment. The ununhexium would then decay, including a small measure of antimatter in its decay product. Its second function, discovered later, allegedly lay in the intense strong nuclear force field of its superheavy nucleus. This field extended barely usably beyond the atom's perimeter. But properly amplified, this could be employed as a variant of gravity. "Gravity B", as he claimed project scientists referred to it, could thus be employed to "shape" a craft's relation to the gravitized space around it. Lazar said this property explained the "triple dome" structure frequently shown in sketches and photographs of saucer-shaped UFOs, which he believed to be the crafts' gravity amplifiers. Lazar described ununpentium as a heavy dull orange metal which had to be properly machined for such use. He ascribed the element's absence on Earth to the fact that the supernovae in Earth's region of the galaxy were insufficiently massive to produce nuclei of this density, but other parts of the universe are richer in this element. These areas, according to Lazar, are inhabited by the adventurous (but to date comparatively reclusive) extraterrestrial visitors who could employ it. A significant supply, he claimed, was acquired through direct exchange by supersecret US government operations at Nevada Test Site Area 51.